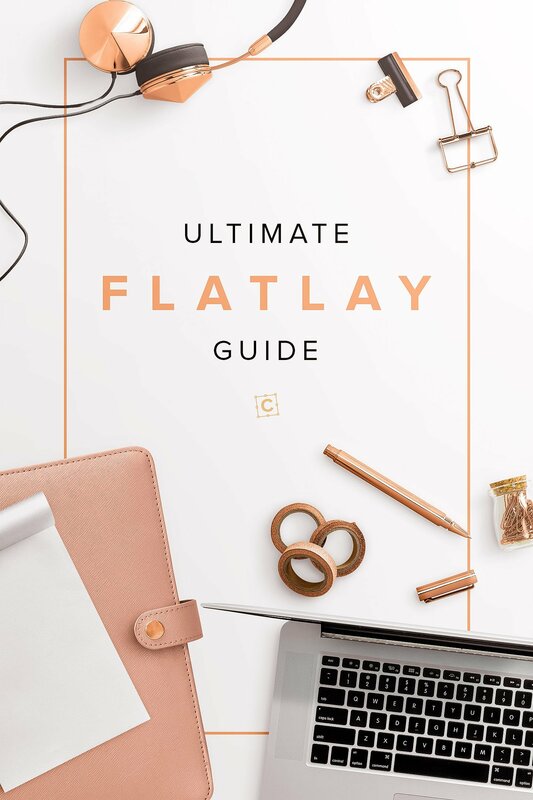 Of course, every blogger and instagrammer would have you believe that their flat lays just fell into place with no forethought or effort… but to style the perfect flat lay is in fact a science with a number of elements to consider. When using Custom Scene to create your flat lay, you have already made your life a lot easier by cutting out some of the trickier elements that come along with photography. Things like getting the correct lighting, finding a good angle to shoot from and keeping a steady hand have all been taken care of for you, so all you have to worry about is the layout and composition of your image. First things first, you need to decide on the layout of your flat lay. Think about the purpose of your image; would you like to draw attention to one item, or are you planning on adding some text or a graphic to accompany the mock up? Will your chosen items work well in a grid format, or better within a more dishevelled arrangement? The most traditional style when it comes to flat lays, this layout lends to organizing your items into grids of perfection. As you will see from the example below, the items sit square to one another, usually with equal spaces throughout. You can do this by eye or if you really want to indulge your inner OCD go ahead and use the guides in photoshop to get your grids spot on. If you like the uniformed look, but want to give your flat lay an edge, you can play around with the angle of the grid to add some interest to your composition and add some variety. You can have some fun with this one. Think about what you want the focal point of your flat lay to be, where you want to draw the eye. Once you have that object in place, you can arrange the other items around it to create movement, almost pointing towards your star object. An advantage of using Custom Scene when creating your flat lays is that you have the freedom to play around with the placement of your chosen items. Keep on moving objects around until you’re happy with the structure and balance of your image. It might be that you are creating a header for your blog post, or designing a graphic featuring your logo. When using Custom Scene, the beauty is that you can go ahead and place your chosen text or logo in the photoshop file right from the beginning, so you are clear on the space you have to play with and the area you are highlighting. We think the relaxed lifestyle flatlay format works well with text, just be sure to leave enough space to frame your text nicely. When arranging the object in your flat lay, don’t forget your spacing! The use of negative space in your flat lay can be just as important as the items you include, and gives the mock up a feeling of balance. When an image is over crowded, it can look messy and you can lose the impact of the individual items. So, by giving your items room to breathe, you can keep it looking clean and fresh. On the subject of keeping things pleasing to the eyes, the colours you choose to include will greatly impact the overall look of your flat lay. Try to keep your colour palette uniform, perhaps sticking to muted tones, colours within the same tonal range, or the classic monochrome. While a simple plain white background will always set the scene perfectly for your flat lay, we also love to see some texture incorporated. Think stunning white marble, a ruffled cable knit blanket or even disheveled bed sheets. However, you will want to steer clear of any bold colours or heavy patterns, and if in doubt, stick to white to really make your items pop. The winner will be announced on 11th April 2017. Next post: Because life is better in High Resolution.. Upgrade for free!